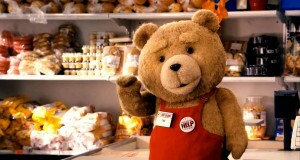 Mark Wahlberg Confirms The Sequel to ‘Ted’!! While Mark Wahlberg was on Anderson Cooper’s show today, promoting ‘Broken City‘, somebody asked if there was going to be a sequel to ‘Ted‘, which is Wahlberg’s biggest grossing movie to date, and is one of the top grossing ‘R’ rated films out there, if not the number 1 spot. Well, he confirmed it, saying it’s a done deal and that Seth MacFarlane is already working on script for the sequel. However, Wahlberg still has to shoot the next ‘Transformers‘ film and do press for Michael Bay’s upcoming ‘Pain and Gain‘ movie, while MacFarlane will most likely do his western film ‘A Million Ways to Die in the West‘ first. So, a couple of years will pass before we see ‘Ted 2‘, but time goes by fast, so it will be here before you know it. And yes, Wahlberg and Mila Kunis have signed on to do the sequel. I can’t wait to see a sequel. Should be good. I wonder if Ryan Reynolds will have a bigger part this time? Amanda Seyfried set To Star in ‘Ted’ Sequel!! The New Trailer for ‘Ted 2’ Had Me In Stitches! This entry was posted on Thursday, January 17th, 2013 at 9:09 pm	and is filed under Film, News. You can follow any responses to this entry through the RSS 2.0 feed. You can skip to the end and leave a response. Pinging is currently not allowed. « New Music From The Strokes Dropping in 2013!! !